On Wednesday at Eastern High School, senior Jessica Cook signed her letter of intent to join the Shawnee State cross county and track and field teams. Sitting in the front row, from left, are John Cook, Jessica Cook, and Patty Cook. Standing in the back row are Eastern head coach Josh Fogle, SSU head coach Eric Putnam and EHS Principal Shawn Bush. 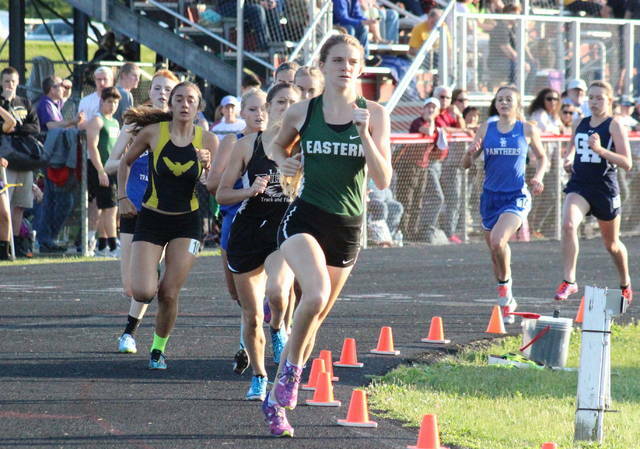 TUPPERS PLAINS, Ohio — Now in the final leg of her decorated high school career, Jessica Cook has chosen where she’ll run next. 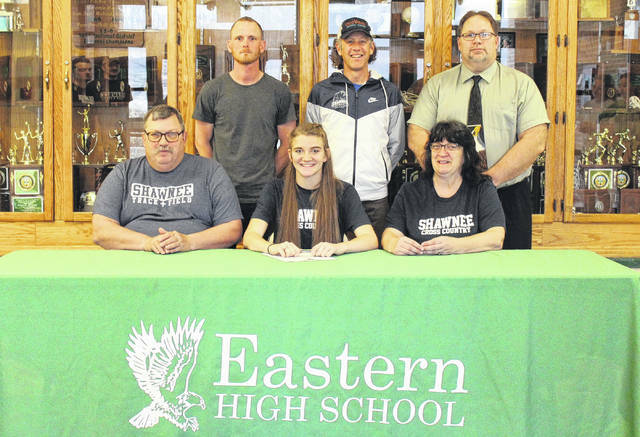 On Wednesday at Eastern High School, Cook signed her National Letter of Intent to join the Shawnee State University cross country and track and field teams next fall. In four years of cross country for EHS, Cook qualified for the state meet three times, with her best state finish being 19:35, a 21st place mark in her freshman year. In cross county, Cook was league champion as a sophomore and a junior, while finishing second in the league in her freshman and senior seasons. Cook was top-5 in the district meet in all-4 seasons at EHS. Cook is the school record holder for girls cross county with a time of 19:05, which she ran in her sophomore season. In track and field, as a freshman, Cook was a state qualifier in the 1600m run and the 4x800m relay. In her sophomore campaign, Cook was a state qualifier in the 800m run. Cook is the current school record holder in the girls 1600m run with a time of 5:17.05, which came in her freshman season. Jessica credits EHS and head coach Josh Fogle for helping her become the runner that the is today. In Cook’s previous seven seasons of varsity competition — four cross county and three track and field — the Lady Eagles have won the league and the district all-7 times. Cook will be joining a SSU program that competes in the NAIA and Mid-South Conference. The Bears are led by head coach Eric Putnam. At Shawnee State, Cook — who held a 3.3 grade-point-average in high school — will major in Nursing.